Layers allow for a non-linear workflow. You can work with a model at many different stages of development simultaneously. Add details such as a reptile’s skin scales then turn those details off and refine the major forms underlying them. The Layers list displays all the layers for the selected SubTool. Up to eight layers are displayed at one time; move the scrollbar on the left to show all layers. Layer Intensity sets the amount of distortion for the selected layer. A value of 1 gives the Layer as it was sculpted while in Record mode; higher values will exaggerate the effect, negative values will invert the effect. When in Record mode the value is always 1 whatever the setting of this slider. The ‘up arrow’ selects the layer in the layer menu immediately above the currently selected layer. 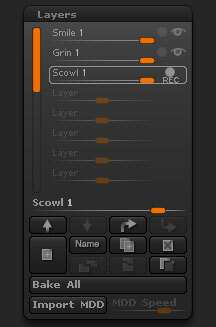 The ‘down arrow’ selects the layer in the layer menu immediately below the currently selected layer. The ‘up and over arrow’ moves the currently selected layer one layer up in the layer menu. The ‘down and over arrow’ moves the currently selected layer one layer down in the layer menu. The New Layer button will create a new layer, automatically switching on Record mode. Polypaint, Shape change, and/or Masking can be saved on Layers. When using a ZSphere for rigging a Layer will also be used to save poses. Allows you to rename the currently selected layer. Delete the currently selected layer. The Split button will split any layer that has Polypaint and/or Shape and/or Masking into separate layers. For example, a Layer with Polypaint and Shape change on it would be split into a Polypaint layer and a Shape Layer. The Merge Down button will merge down the selected Layer into the layer immediately below it. The Invert button will invert all layer detail to be opposite of what it was originally sculpted, painted, or masked in. Bake and delete all layers. Layers will be baked at their current intensity. The Import MDD button will import any MDD file to be saved on a Layer to be used on the Timeline. The MDD Speed slider sets the playback speed of the MDD Layer.